Ever since the declaration of NEET PG 2018 results, candidates have been eagerly awaiting the counseling notification. 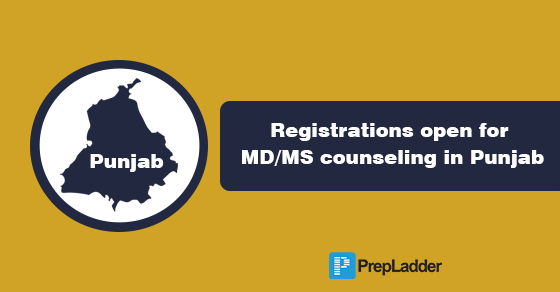 A notification has been released in this regard which describes that the Combined Counseling for admission to PG Medical courses in all Medical Colleges including the ones under Private/ Deemed Universities in the state of Punjab will be conducted by Baba Farid University of Health Sciences, Faridkot. Registration for admission to PG Medical, PGDSM and six months training in Ultrasonography course is to be undertaken online at the University website www.bfuhs.ac.in . We are here with important dates and details related to the registration process so that you don’t find any difficulty in the registration process. Only PCMS in-service candidates are required to submit printout copy of online Admission Application Form alongwith self attested copies of certificates and university copy of bank challan at University. The candidate should possess basic qualification i.e MBBS. Eligibility and merit of a candidate for admission against any PG seat will be determined by the Admission Committee, strictly as per the rules and regulations laid down in the Punjab Govt. Notification. Counseling/ Admission shall be conducted by the Admission/ Selection Committee constituted by the Punjab Government for this purpose. For more details, refer to the Prospectus. Candidates are required to deposit the fee in the University account (printed on the bank Challan) through any branch of the Oriental bank of Commerce. In the government institutions, 50% of the total seats shall be filled at All India level, and remaining 50% seats shall be filled at the State level as State Quota seats. 50% seats of the State Quota seats shall be reserved by the way of Institutional Preference, for general category candidates who have passed their qualifying examination from Baba Farid University of Health sciences, Faridkot. For In-service candidates (PCMS) incentive shall be granted upto 30% of the total marks obtained in NEET PG 2018 as per the provision of Post Graduate Medical Regulations 2000 of MCI.